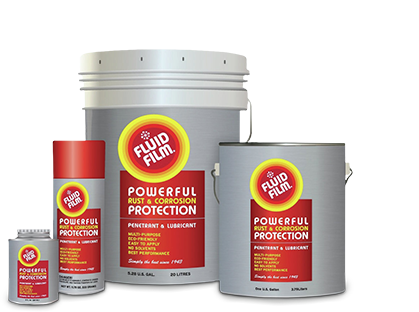 FLUID FILM® products offer powerful corrosion protection for all metals and superior lubrication for all moving parts. They are long lasting, thixotropic liquids and gels that have been used for over 55 years in the highly corrosive marine environment of ships and offshore drilling rigs. More recently they have been introduced and successfully utilized in the lawn & garden, aviation and automobile industries, as well as providing a non-hazardous/non-toxic solution for home maintenance. Facilities where they are used include government, commercial fishing, gas companies, farming, salt, power, and industrial plants. FLUID FILM® is formulated from specially processed wool-wax, highly refined petroleum oils and selected agents to provide corrosion control, penetration, metal wetting and water displacement. These long lasting products contain no solvents, will not dry out and will penetrate to the base of all metals, providing corrosion protection from both natural and industrial atmospheres. Heavily corroded and/or frozen parts such as nuts, bolts, shafts, etc. that would normally be damaged during maintenance, can be salvaged by applying FLUID FILM®. Oily amber transparent liquid. Lanolin-based coating. Solvent free. Non-toxic. Will not evaporate. Reacts with moisture to form a soft gelatinous barrier. This mixture is chemically combined and thus is unavailable to cause corrosion. Amber, soft gel. Lanolin-based coating. Solvent free. Non-toxic. Will not evaporate. Anti-corrosive coating, lubricant and penetrant for all metals. Used in heavy marine and general industry, particularly for ballast tanks and voids, chains, hoists, wire rope, winches, turnbuckles, conveyors, bearings, augers, drills, valves, linkages, scales, joints and zert fittings. Preserves parts in storage or during shipment. Used in the maintenance of aircraft, heavy equipment, and automobiles. Also used in refineries, salt plants, power plants and gas companies. Permanently soft gel. Conforms to MIL-PRF-18458 C. Submarine Material Usage Category-Limited-100°F Maximum Temperature. WRO-EP is recommended for the general maintenance of wire rope. It provides corrosion protection and lubrication for standing and running rigging, drag lines and bridge cable. The high tackiness of WRO-EP minimizes throw-off on higher speed running rigging and provides higher resistance to water abrasion and washout when used in tidal areas. Extreme pressure properties provide excellent lubrication for both wire rope and open gear applications. Permanently soft gel with extreme pressure properties. WRN-EP is recommended for the general maintenance of wire rope. It provides corrosion protection and lubrication for standing and running rigging, drag lines and bridge cable. WRN-EP provides higher resistance to water abrasion and washout when used in tidal areas. Extreme pressure properties provide excellent lubrication for both wire rope and open gear applications. Permanently soft gel coating. Anti-corrosive coating for large metal surfaces such as tanks, structures, etc., where a permanent soft coating is not objectionable. Specifically formulated to resist the degrading action of sunlight. Not for use on surfaces which will have a temperature in service of over 158° F (70°C). Permanently soft gel coating for all metals. Will not evaporate. Lanolin-based coating. Solvent free. Non-toxic. Anti-corrosive coating for all metals. Protects against attack by moisture, salt solutions and atmospheres in marine, agriculture and industrial environments. Applications are made in a single coat to ballast tanks, void spaces, pontoons, etc., on both new and old constructions. For use on equipment requiring protection from corrosion for extended periods.